The use of Architecturally Exposed Structural Steel (AESS) in modern design and construction has given rise to a new trend of architectural expression. Architecturally Exposed Structural Steel you can best describe as a combination of aesthetics and precision engineering. It is what the famous architect, Mies van der Rohe, would describe as “less is more”, where the exposed structural steel components are what define the building. Structural steel is one of the most elegant materials used in construction today. It is both handsome and functional. Architects and engineers have a particular interest of laser fused stainless steel sections because of the clean lines and minute welds. Our laser fusion process offers a wide variety of steel profiles for your exterior and interior design needs. Laser fusing is our most efficient production process of exposed steel shapes. Sections are precisely cut using laser technology and fused together with a nearly invisible weld bead with no filler material. The highly concentrated thermal energy of the laser allows for pinpoint accuracy. The process results in pieces that are either solid or hollow formed to fit tightly together. Laser fused components have sharply defined edges and extremely small radii. The laser production method results in sleek, flawless shapes, such as flat bars, angles, channels, tees, and hollow square or rectangular sections. Laser fused stainless profiles are available in a variety of surface finishes, including polished or satin, that is generally more refined than the finish on extruded or hot rolled products. 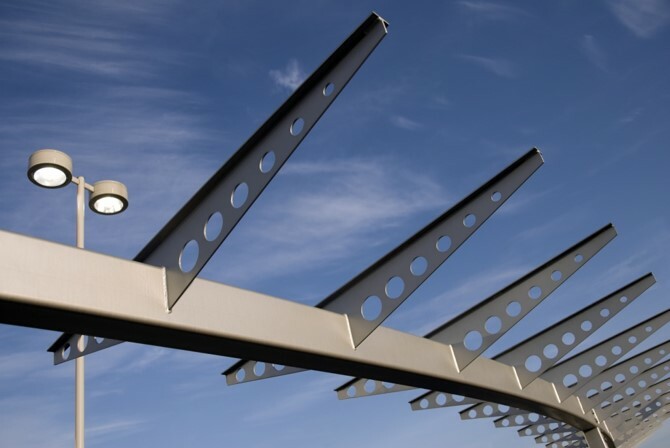 This makes stainless structural elements perfect for use as architectural and sculptural features. These components are bead blasted and passivated in an acid solution to remove any impurities. The laser fusing process at Stainless Structurals meets all the requirements for AESS specifications that comply with the AISC guidelines for the highest quality aesthetic appearance for exposed stainless steel applications. We are ISO 9001:2015 certified which means we have strict guidelines for quality control during manufacturing that includes multiple checks with precise measuring tools, resulting in proper certification. Our laser fused structural components adhere to the ASTM specifications of A1069/A1069M-16. Stainless Structurals is a global leader in the structural steel industry. Our laser fused products like Structural Steel are of the highest quality. Our stainless shapes are strong and durable, corrosion resistant, sustainable, low maintenance, and visually stunning. We are able to provide standard and custom steel solutions for most component special profiles needed for your particular project. Please contact us today for more information about our capabilities and our global services.